2017 Wallpaper catalog up on issuu.....!!! If you've been wondering what we've been working on all year....the work is starting to roll out in preparation for ICFF 2017. We'll be at booth 110 if you come to the show, be sure to stop by and see all the new work! It's really hard to squeeze 10 of something on to a playing card! So for the ten of diamonds you'll see 10 hard little plastic doohickeys. Yeah, I said doohickeys. They just keep coming! Thoughts? What you like to see on the 10? 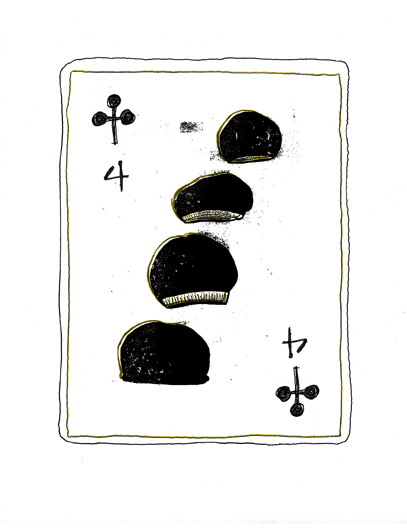 The Ace of Diamonds from Nottene's deck of cards. This means my deck is 1/4 done! I can't believe it! I've been trying to make progress on this project through all of 2013 and I got nowhere....little steps has made such a difference. No the big question is what suit will I start next week?....!! Nine little donuts, all in a pile. Emotions dominate the eight of clubs....mums for cheerfulness! The one-eyed Jack is usually in the heart and spade suit, but my youthful Jack of clubs shows only one eye. 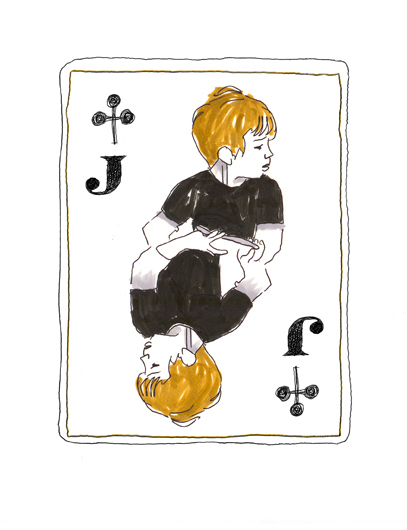 Jacks are known as tricksters, and the Jack of clubs is sometimes called the card of the future, sometimes represented as a fiery youth. p.s. There are only 3 cards left in this suit! That means the deck is one quarter finished! Any thoughts on what suit I should tackle next? Catch up deck of card post....the 6 of clubs! All Six of Club feel an obligation toward duty and they take their responsibilities seriously. Trouble is, the 6 of Club also symbolize inertia, and easygoing lethargy. The King of Clubs is rumored to be creative, but careless. 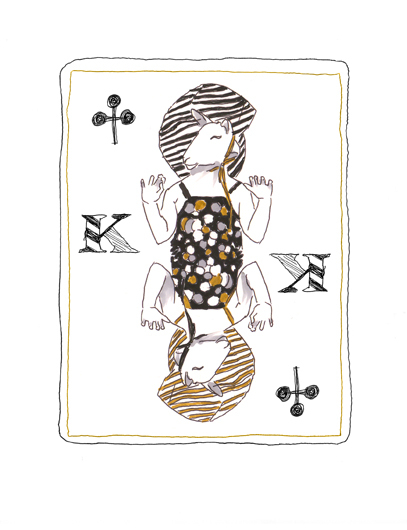 Our King of Clubs rules youth, irresponsibility, musings, and the mind (rather than the body). As with our other Club cards the lightness of Air and the freedom of Summer are themes here. His swimsuit and the raw simplicity of the young lamb represent the qualities of our King. Word is number five symbolizes change. What better than 5 little acorns ready to grow into big oak trees? Clubs are also said to represent summer and youth, and these young nuts are totally immature and wild reckless things.....they roll through the forest floor, wandering aimlessly towards the spot they'll finally land. Well, I was gunning for a face card this week, but I got hit with the sick instead. So I present the straightforward 4 of clubs today. Clubs are said to represent the mind & intellect and number 4 is service related, so in service to our minds we have 4 beanies to keep your smarts toasty and warm. Next up in the club family is our little friend number 3. The three of clubs is unpretentious. Three little fall leaves fall in a pile near our clubs and collect autumn sunshine for later.